Young animators in London have won a national competition with their one-minute film about a frustrated penguin. 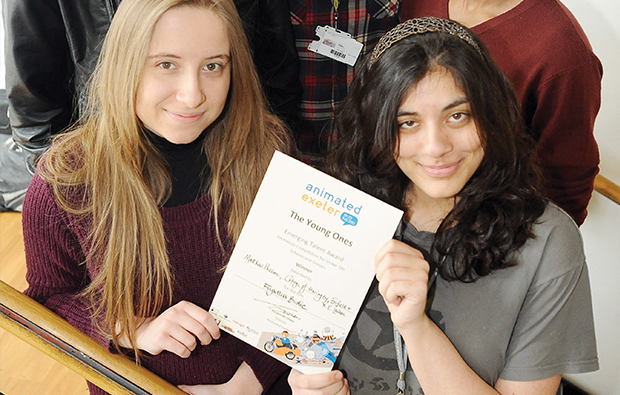 BTec animation students at The College of Haringey, Enfield and North East London submitted the film, Flightless Birdie, to an under-18s award at the Animated Exeter Festival, the largest festival of its kind in the UK. The animation was shown alongside work by professional animators such as the British visual effects company, Double Negative, whose film work includes Skyfall. Featured image caption: Two members of the award winning team, From left: Victoria Ardamatskaja, and Melda Mahmutoglu, both 18.